The starting salary for a 2015 graduate with a degree in computer science is $52,237, according to forbes.com, but even with the allure of a fat first pay-check, the percentage of females with computer science degrees still remains at a low 12 percent. DePauw is no exception, but student organizations are continuing to combat this problem. On DePauw’s campus there are 11 senior and 26 junior women majoring in computer science. The percent of female majors in computer science in the junior class is 42 percent, and this might have recently gone up. The exact ratio between men and women was not available from the computer science department. Junior computer science major Beth Chelmowski believes there is a difference in the gender of class makeup since her first year at DePauw. "I have noticed that the amount of girls in my computer science classes have increased compared to my freshman year," said Chelmowski. 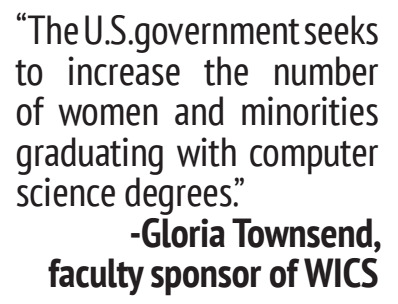 Professor Gloria Townsend, the faculty sponsor of the WICS, Women in Computer Science, started working with the club because she was concerned about the low number of women in computer science. Despite the low national rates of women in the field, DePauw outreach is large. WICS is affiliated with other science groups like the ACM, the Association for Computing Machinery and the ACM-W, the Association for Computing Machinery—Women. WICS is also affiliated with the STARS Alliance, a group of 50 selected institutions that the National Science Foundation funds. Senior Noemi Benitez champions the success of STARS in an email. Benitez believes that programs such as STARS that create community within a department lend to more female computer science majors. The junior class, which Benitez said is at about 42 percent, is impressive. Benitez wrote, "This percentage is double the national average!" Whatever the reason for the small numbers nationally of women in science fields, DePauw has multiple ways to get involved and give minority students in the field the confidence and support needed to earn a degree in computer science. WICS is not only a great opportunity to study computer science, but students say it is a fun enriching environment as well. Most women at DePauw join the WICS because they are majoring in computer science, but you do not have to be a major to get involved. “It doesn't matter what you study, if you've ever been interested in hardware, coding, or robots, drop us a line at robotics@depauw.edu,” said Castle. In addition to WICs there is also the ACM-W. This group also provides lots of opportunities for women in science fields. The ACM-W is part of ACM, but both provides a space for women interested in technology. Both the ACM and the ACM-W are accessible to many people. “I saw that they were willing to work with me and that my lack of experience did not matter” said junior Justine Clark, a member of the ACM. Despite the low number of women in computing in the United States, at DePauw there are opportunities to get involved and participate in this field of science and technology.